... the effects of the Moon in Cancer in the 12th house (both house and sign being mystical), in trine to Herschel from the mystical sign Pisces, from the house of science, and from the mundane trine to Saturn in the scientific sign Aquarius, which latter planet is in square to Mercury in Scorpio and in quintile to the Sun and Jupiter in the mystical sign Sagittarius. Raphael's delineation allows us a glimpse into the transitional stage between Lilly-style 'traditional' and post-Leo 'modern' astrology. The first of the trans-Saturnian planets makes an appearance and so does Kepler's exotic quintile aspect. The 12th house is no longer necessarily the realm of sorrow, imprisonment and treachery but is designated 'mystical' - along with Cancer, Pisces and Sagittarius. A century and a half after the glory days of Lilly, Culpeper, Gadbury and Partridge, astrology has become, in Raphael's words, a pursuit for those "whose minds soar above the cloggings of this terrestrial element", and we are on the road to humanistic and psychological astrology. Yet for all Raphael's fixation on things mystical, the 9th house, traditionally the house of visions, dreams and prophecy, seems inexplicably to have become "the house of science" - ironic in a consideration of the chart of William Blake, whom one biographer described as a "mystical revolutionary" and another called "the last great religious poet in England". And there Jerusalem's pillars stood. His parents, James and Catherine Blake, ran a moderately prosperous hosiery business. They were shrewd, plain traders but William, their third son, "his head in the clouds amid radiant visions", showed no signs of following in their footsteps. With Neptune on the 2nd cusp, no modern astrologer would be surprised to learn that he had no head for figures or account books. His father "sent [him] away from the counter as a booby". And then there were those visions. Once his mother beat him when he told her about an early angelic visitation, though she intervened on another occasion when his father threatened to do the same. This hostility cut deep. All his life Blake was afflicted with what he called "the nervous fear" which arose from the threat of parental tyranny and developed into a deep mistrust of authority figures of any kind. Saturn, which traditionally denotes the father in a nocturnal chart, opposes Mars (and Neptune) from the 8th house, which Lilly called a house of "fear and anguish of mind". Inevitably, Blake's art has been interpreted in terms of a monumental Oedipal struggle. Whatever Blake's perception of them, his parents did all they could to encourage their peculiar son, whose moods swung between the fiery self-assertiveness of Mars in Leo, Sun and Jupiter in Sagittarius, to the clinging dependency of Moon in Cancer. Realising that he was too volatile for conventional schooling, his mother taught him to read and write at home (the Moon forms a close sesquiquadrate with Mercury). Blake became a voracious reader, even if his spelling and grammar were sometimes unorthodox. "Thank God I never was sent to school," he later wrote, "To be Flog'd into following the Style of a Fool". When he became interested in art, his father bought him prints of old masters and copies of classical sculpture. His early drawings were proudly displayed on the parlour wall. Blake's lunar sensitivity brought out his parents protective instincts and he was also fortunate in his marriage to Catherine Boucher on 8th August 1782. Catherine was equally supportive. She helped him in his work and attended to many of the everyday practicalities that Blake himself was too distracted to deal with. They fell in love at first sight and remained devoted to one another for 45 years. Aged 14, Blake was indentured as an apprentice to James Basire the master engraver, who also seems to have responded sympathetically to Blake's other-worldliness. When two rowdier apprentices joined his establishment Basire - realizing that Blake "was too simple and they too cunning" - sent him out of harm's way to make drawings of the tombs and monuments in Westminster Abbey for a set of engravings commissioned by the Society of Antiquaries. Working alone in the ancient abbey, Blake discovered "the simple and plain road to the style of art at which he aimed, unentangled in the intricate windings of modern practice." Unfashionable as it was in the age of Reynolds, Gainsborough and Constable, the medieval Gothic style, as exemplified in the paintings, sculpture and architecture of Westminster Abbey, came to represent for Blake a pure art of inner vision. Although he became a student at the Royal Academy before embarking upon his career as a professional engraver, he remained contemptuous of the painterly Academy style which he regarded as contrived and concerned only with the external representation of form and proportion rather than the inner reality. Blake's attraction to a remote, spiritualised past reflects a general awakening of interest in British mythology and history, both popular and academic, which took place during his lifetime. Antiquarians speculated upon the supposed druidic temples of Stonehenge and Avebury; theories that the British Isles were the last remnant of lost Atlantis circulated; and the 'Ancient Order of Druids' held meetings in a pub around the corner from Blake's London residence. He avidly read the pseudo-medieval verses of Thomas Chatterton ("Strayt was I carry'd back to Tymes of yore...") and the works of James MacPherson, a Scottish clergyman who assumed the literary persona of the Celtic bard Ossian, son of Finn MacCool. MacPherson's verses provoked a long-running and heated scholarly debate as to whether they were authentic fragments of bardic poetry or romantic forgeries. Not that Blake cared one way or the other. "Ages are All Equal," he declared, "But Genius is Always Above the Age". To Blake, Chatterton and 'Ossian' conjured up a timeless atmosphere of misty heaths, ancient temples and brooding spiritual presences. While Raphael saw Blake's Moon in the 12th as "mystical", it also describes the artistic and social isolation he endured throughout his life. Not much chance of acceptance in polite society for a dinner guest who might break off at any moment to chat with a passing archangel! All his contemporaries thought him a little odd; many thought he was insane, though the poet Wordsworth conceded that there was something in Blake's madness " which interests me more than the sanity of Lord Byron and Walter Scott". Blake: Pray, Mr. Taylor, did you ever find yourself as it were, standing close beside the vast and luminous orb of the Moon? Taylor: Not that I remember, Mr. Blake: did you ever? Blake: Yes, frequently; and I have felt an almost irresistible desire to throw myself into it headlong. Taylor: I think, Mr. Blake, you had better not; for if you were to do so, you most probably would never come out of it again. 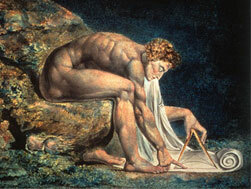 Uranus was discovered in March 1781 when Blake, aged 23, was just embarking upon his career as professional engraver. Synchronous world events like the American War of Independence (1776-83) and the French Revolution (1789-99) have contributed to our astrological perception of Uranus. Blake was certainly attuned to the Uranian zeitgeist. Less than a year before the discovery, he was swept along in the Gordon Riots that rocked London in August 1780. He witnessed the climactic burning of Newgate prison and was lucky not to have been arrested and hanged in the savage reprisals that followed the rioting. In 1792 he went about the streets of London wearing the bonnet rouge as a gesture of solidarity with the French revolutionaries - though he quickly discarded it when reports of Robespierre's 'reign of terror' began to filter through. He was acquainted with freethinkers like Joseph Johnson the radical publisher, Mary Wollstonecroft the proto-feminist and the republican Tom Paine whose writings were instrumental in inspiring the American Revolution. But Blake was an outsider even among the radicals. With Uranus occupying his 9th house, there was always a spiritual dimension to his Utopia that was out of step with fashionable atheism. According to an early biographer, he was "a heretic amongst the orthodox", yet "here among the infidels he was a saint and staunchly defended Christianity - the spirit of it - against these strangely assorted disputants". Blake's outrage at the social injustices he saw all around him stemmed from natural humanitarian instincts rather than any political creed. There are several stories of his furious intervention against the casual cruelty that was part of everyday street life in 18th Century London. In poems like 'The Chimney Sweeper' and 'The Little Black Boy' he condemned such fine old British institutions as child labour, racial stereotyping and the slave trade. His lines: "I see London blind and age-bent begging thro' the Streets of Babylon, led by a child â€¦ " have a disturbing resonance with modern urban decay. Of course he wasn't alone in his condemnation of injustice and inequality but Blake's perceptions were often far ahead of his time. No-one before Freud, and certainly no-one else in the 18th century, could describe war as a manifestation of repressed sexual energy as Blake did. Many of Blake's attitudes correlate with what we now regard as Uranian qualities: he was an individualist and an egalitarian; he was cantankerous and regarded as eccentric; his ideas were incomprehensible to his contemporaries but make more sense to later generations. Raphael suggested that the Moon trine Uranus had something to do with Blake's mysticism. Although the aspect is applying, the orb seems rather wide. Before the Moon completes the trine to Uranus, however, it makes an opposition to Venus, and Venus is closely sextile Uranus. I would suggest that it is through Venus - the only planet in an earth sign - that Uranus is integrated into the chart and principally manifested itself in Blake's life. Although Blake's art is highly regarded today, it was never commercially successful during his lifetime. He earned his living as a jobbing engraver and illustrator and wrote that from the beginning of his apprenticeship right through his old age, he "never suspended his labours on copper for a single day" - a remarkably literal correlation with Venus in Capricorn and the 6th house. It was Blake's skill as a craftsman that enabled him to give expression to his inner vision and to combine his poetic and artistic genius through the medium of his gorgeous illuminated books. In order to achieve this, Uranian Blake invented a new style of engraving. The technique-known as 'relief etching' - involved applying his design to a sheet of copper using a paintbrush dipped in a mixture of salad oil and candle grease. The mixture resisted the acid which bit into the surrounding copper for three or four hours, leaving the design raised above the plate - a reversal of the usual engraver's technique where the design is etched into the copper. Blake's innovation enabled him to paint his design directly onto the copper plate prior to printing and hand-colouring. Freed from the constraints of the traditional letterpress, Blake's illustrations and calligraphy flow harmoniously together in his glowing illuminated books of poems and prophecies. Thanks perhaps to that free-flowing sextile between Venus and Uranus, Blake can be described as the world's first multimedia artist. According to the traditional method of assessing the essential dignities of the planets, Jupiter in the first degree of Sagittarius, with dignity by sign, triplicity and term, emerges as the strongest planet in the chart, the 'lord of the geniture'. Blake's best-known lyrics, like his 'Tyger, tyger burning bright" and the stirring lines from the prologue to Milton quoted above,  are breathtaking evocations of Sagittarian fire and vision. Blake liked to work on an epic scale. Beginning with The Book of Thel in 1789, he produced a series of illuminated 'Prophetic Books' in which he explored and elucidated his concerns for the spiritual condition of humanity as the Age of Reason gave way to the Industrial Revolution. Through a complex personal mythology, which developed and evolved as the prophecies emerged, Blake traced the perversion of primal innocence and its enslavement to the "mind-forg'd manacles" of custom and law, which deny both love and freedom. Albion - the spirit of Britain - has fallen into a death-like sleep from which it must be awakened. For Blake, the key to salvation lay in unleashing the power of the creative imagination. Blake's imagination soared. He read widely and drew inspiration from everywhere, freely adapting ideas he liked into his personal mythology. He identified the patriarchs of the Bible with the druids of ancient Britain; traces of cabalism and alchemy, the influence of Boehme and Paracelsus, have all been discerned in his words and images. But Jupiterian Blake's refusal to tailor his imaginative flights or to make any concessions towards the audience he hoped to attract have been criticised as arrogant. The giant, restless figures that stalk the Prophetic Books bear outlandish names and symbolic associations that are difficult to grasp. No wonder that Blake's major poetry brought him only ridicule during his lifetime; and today while many of us can sing along to a rousing chorus of 'Jerusalem', the intricacies of 'Palamabron's Dispute with Los' from the same poem are likely to remain forever obscure. "One never knows what one will find", wrote one modern critic, "The reader ploughing through pages of 'dismal howling woe' comes across an unexpected line of startling beauty which only Blake could have written". With his lunar sensitivity and insecurities, Blake must certainly have felt a sense of disappointment at his lack of artistic acceptance and commercial success. There were compensations however. Towards the end of his life, he became the centre of an admiring group of younger artists, among them the water colourist and astrologer John Varley,  who found inspiration in his imaginative art and courageous individuality. "I must create a system", Jupiterian Blake declared, "Or be enslaved by another man's." "Just before he died His countenance became fair - His eyes Brighten'd and he burst out in Singing of the things he saw in Heaven..."
The inscription reads: "William Blake, one who is very much delighted with being in good company. Born 28th November 1757 in London and has died several times since". Blake's view of Newton depicts the great scientist as a coldly logical being, separate from nature and wholly lacking in imagination. 1 ] The Urania article and horoscope are reproduced in The Life of William Blake by Mona Wilson p.380 (Paladin 1978, originally published 1927). 2 ] The quotations in this article are from Mona Wilson's biography cited above and/or Blake by Peter Ackroyd (Minerva 1996). 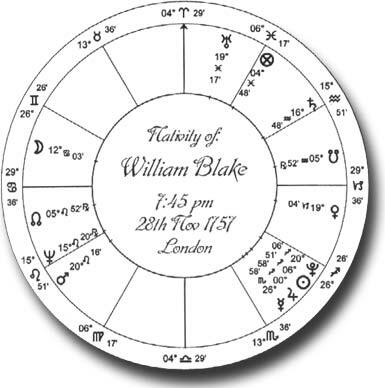 3 ] Blake was born on a Monday (Moon-day) in the hour of the Moon. In his chart, the Moon has dignity by sign and triplicity; she is in the condition of hayz; she is almuten of the 1st house and also of the 11th house. 4 ] Although Mars opposition Saturn is not usually associated with mystical or visionary powers, it also occurs in the horoscopes of St Teresa of Avila and Emmanuel Swedenborg. Blake studied and admired the writings of both these mystics. 5 ] Set to music by Sir Hubert Parry and popularly known as 'Jerusalem', many 'sons and daughters of Albion' now regard this as an alternative National Anthem. 6 ] For an account of Blake's collaboration with Varley in the curious experiment of the "visionary heads", see Patrick Curry: A Confusion of Prophets (Collins & Brown 1992). pp.25-8. This article was first published in The Traditional Astrologer Magazine (Ascella Publications), issue 17, September 1998, pp.32-36. Reproduced online 19 November 2004.